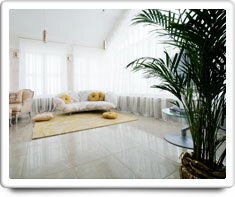 Marble Floors are a type of flooring made from natural stone. Marble Floors are typically constructed using thin square or rectangular-shaped tiles, which have grouting material in between them to hold them in place. Marble is a very hard, but porous surface. Spills should be cleaned up immediately to keep stains from seeping into the surface pores of the marble flooring. Carpets & Rugs and Hardwood Floors. Shown in the 'Routine Care' section are the recommended routine maintenance tasks for your marble floors. The 'Q & A' section shows answers to common questions. And the 'Articles' section provides helpful articles about your marble floors.